I will move daily. I did do a pretty good job of this. I made a point of walking when I'd normally be sitting (like while on the phone). And I got some walking in while in town on Tuesday/Thursday. I need to be more intentional about this though, especially on days when I'm home. I will drink water. Okay, so while I'm still failing by most "expert" standards, I started every day except one (the morning it was 49 degrees in the house!) with a big glass of cold water. I actually found myself waking up in the morning thinking about how much I wanted a glass of water. And I did not have any Mountain Dew. My kids did not make this easy. While shopping, they went and grabbed one and put it with the groceries. And Thomas grabbed one for me in Walgreens. I had to put them back. That was probably the hardest thing I did all week. Eat sensibly. I did okay at this. I shopped on Thursday to pick up some things (mushrooms, spinach...) that make this easier for me. I ate a good breakfast all week, which is a major first step. Beyond breakfast, I didn't do anything stupid. Splurged on cheese fondue last night. Working out. I only did two things that were explicitly a work out -- T-Tapp instructional video on Monday and Wednesday. If this is what I continue doing, I really do need to get closer to doing it daily. Check in. Well, my promise was every Friday/Saturday, and it is Saturday. So -- mostly good. This coming week could be challenging. I made sure to buy candy that doesn't particularly appeal to me, in case we get trick-or-treaters tomorrow. Usually, we don't. I'll probably have one or two pieces, but this isn't something that is going to scream out at me. As part of the TOS Homeschool Crew, I recently had the chance to investigate a product called Yuck! Samples of four different types of Yuck were sent to me (you can get yours by going to the website and requesting a sample) by Buckets-o-Fun. 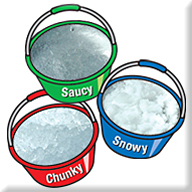 The types are Chunky Yunk, Saucy Yuck, Snowy Yuck, and Sticky Yuck. Also included was a brief pamphlet (very brief) about how to use these products to study science. As the science guide indicates, Yuck is a polymer that absorbs water (lots of water!) and if you follow the suggestions in the pamphlet, you are giving your children some decent experience with the first step in the scientific method: observation. My children, however, were disappointed that they weren't suggesting anything that went beyond that -- you, know, like predicting, testing, refining a hypothesis, etc. So, we started brainstorming ways that WE could use Yuck in our home. What we ended up doing was cutting up a bunch of 2 liter bottles and using the bottom portion to mix up our Yuck. We carefully measured 1/2 teaspoon of yuck into eight different bottles, labeling them with index cards. Each kind of Yuck had two bottles. We put the kettle on to boil, and ran the tap to get good, cold water. Then we added 1/3 cup of near-boiling water to half the bottles and 1/3 cup of really cold water to the other half. Thomas, my 9 year old, is the one who came up with that idea. He expected that the water molecules in the boiling water, which would be moving around much faster than the water molecules in the cold water, would collide with the Yuck molecules much more often, and thus the Yuck would absorb hot water faster than cold. The kids also predicted which kind of Yuck would absorb water faster based on the size of the Yuck particles. Their assumption was that the chunky yuck would be the slowest to absorb, and the other three kinds would all absorb much faster. Connor decided that the Yuck molecules inside of the Chunky Yuck would take awhile to come in contact with water molecules at all. The results were interesting. The Snowy Yuck combined instantaneously with the hot water, and quickly with the cold water. The Sticky Yuck took the longest, which was totally unexpected. In every case, hot water was absorbed faster than cold. Snowy yuck within seconds of adding hot water. It looked like snow almost immediately. Very HOT snow. Interesting stuff. Snowy Yuck after about a minute with cold water. 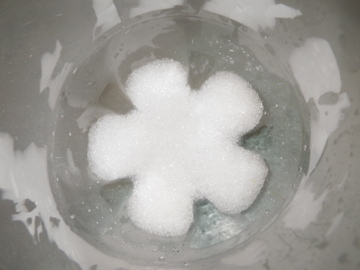 It absorbed water pretty quickly, but it was another minute or so before it looked like snow. As a further experiment, we are adding potting soil to each type of Yuck, plus creating a Yuck-less bottle as well, and we will be planting a couple of lettuce plants (from a germination experiment Connor was doing) in each. Since we live in such a desert-like climate, we are interested in seeing if adding Yuck to the soil will improve plant health. We expect that at least the Chunky and Snowy Yuck will do significantly better, but we aren't sure about the Sticky or Saucy Yuck. The concern is that there may not be enough air getting at the roots in those mixtures. I'll try to remember to post our results in a month or so! 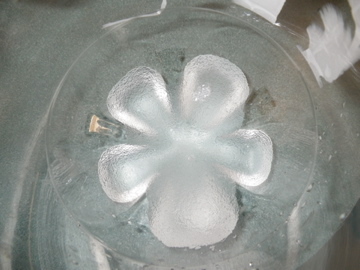 Overall, it has been fun to design our own science experiment(s), and I'm glad we had that opportunity. And if using Yuck as a soil amendment does help us with our gardening, I can see purchasing some, and possibly using it in other play and experimental ways too. If you are intrigued, you can visit Buckets-o-Fun. A pound of Yuck sells for $16-20 depending on the type, and based on our results, that will clearly result in a LOT once it is hydrated! Disclaimer: As part of the TOS Homeschool Review Crew, I did receive a sample of Yuck products. This does not guarantee a favorable review. It does guarantee a review. A fair review. But I am not going to praise something unless I think it deserves the praise. If I don't like it, you'll hear that. And hopefully with enough detail as to why so you can decide for yourself if what I hate about it makes it perfect for your family. For more about my take on reviews, visit my blog post here. Blog Cruise time again. 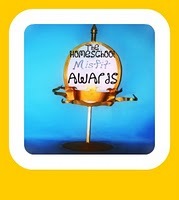 This week: What is your homeschooling style, and how did you choose for your family? 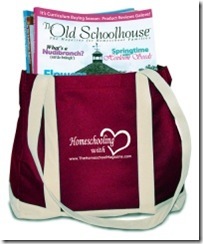 I've called our homeschooling style lots of different things over the years... but really, what it boils down to is that we are literature-rich homeschoolers. We tend kind of classical, but not exactly, and certainly not all the neo-classical 4 year cycle type of thing. So we are studying Latin, spending a fair amount of time on ancient history, and taking or planning courses such as logic and rhetoric. But that doesn't really define us. What defines us is that in many of the subjects, we are using literature as a basis for our studies. Or that we tend towards more "book" and less "text" in the subjects where we use textbooks. What does that look like? Well, my goal is two hours a day of reading aloud to my kids. That covers history, that often covers science, and it certainly covers literature and fun reading. It also may cover geography, Bible/church history, economics, health, P.E., music, art, well pretty much anything. History: we usually are using Sonlight, which schedules quite a few quality books mostly covering history. They schedule some literature studies as well. Literature: for high school, we are using Excellence in Literature, which definitely covers some great literature. At younger ages, I pull studies from Bright Ideas Press, or try to use Teaching the Classics. I make use of some great lists in selecting titles to read (when Sonlight isn't enough) such as The Read Aloud Handbook, Latin Centered Curriculum, or the 1000 Good Books list. Science: we frequently make use of texts such as the Apologia Elementary level ones that aren't so textbooky. We also make a point of using scientist biographies or great books that include science. Music/art/PE, etc. : biographies. We tend to read a lot of biographies. Math: we supplement with books from Living Math's excellent website. Why do we do this? Well, we all love a good story, we enjoy spending time together with a good story, and we sure seem to remember a lot more why's and how's from this approach. Stories appeal to multiple ages, so I can much more easily combine kids. I can borrow a bit from the library, which is always nice. And when we are learning about similar things, it makes for interesting dinner conversation. I'd love to say more, but time seriously got away from me this week. But you can check out what some of my Crew Mates had to say by clicking the graphic above! Okay, I've completely lost sight of the wagon. I started doing Fit Mommy Friday a long time ago, was okay for a short time, and completely fell away. My health is getting to be a mess. I'm very uncomfortable with my weight. I'm embarrassed with my (lack of) fitness level. Since I am so culturally clueless, I'm just setting my own goals. If those running the contest feel my goals are not in line with the intent of the contest, feel totally free to not put me in the running for a prize... but I'm still in for the accountability aspect. Because I desperately need it. I am not setting a weight to be lost goal. I know I'll hyperfocus on numbers, and not focus on health. I want weight loss, don't get me wrong, but I want it to be a side effect of improving a lot of other things. I function much better that way. Missing a day because I spend it puking in the bathroom is not a failure. Missing a day because I'm too busy to take care of myself is. I'm stating that because every time I do something like this, I end up getting really sick in the second week and giving up since I "blew it" already. I'm not doing that this time. My hope is that by December 31, I will have lost about 10 pounds and dropped a size. But I refuse to focus on that aspect. I first discovered What's in the Bible through a Blog Tour for What's in the Bible Volumes 1 and 2. I entered a giveaway (or two!) and won a copy of Volume 1. We watched it and totally fell in love, so we purchased Volume 2, and pre-ordered Volume 3. I wasn't sure if we'd scrape together the funds to purchase Volume 4... so when I got the chance to host a Blog Tour, well, of course I jumped at the chance. What's in the Bible is the latest effort by Phil Vischer and Tyndale Publishing to help walk kids and families through the entire Bible. It is planned as a 13 volume series. Based on the first four volumes, my family will own all thirteen eventually. I will find a way to purchase them. Each volume consists of two episodes, plus special features. Volume 1: In the Beginning --teaches about the Bible as a whole, and covers Genesis. Volume 2: Let My People Go -- mostly teaches about the book of Exodus. Volume 3: Wanderin' in the Desert -- teaches the rest of the Pentateuch. And introducing... Volume 4: Battle for the Promised Land. This title covers the books of Joshua, Judges and Ruth. Episode 1 - Finally, the Promised Land. This episode is about the book of Joshua, and it covers the four different sections of the book. I appreciate how they cover more than just the exciting stuff - the battles at the beginning. They at least touch on the entire book. There is a comment made about how the section where they are dividing up the promised land by tribe might be pretty boring for us, but this was very important to the Israelites. Episode 2 - Circle of Misery. This episode covers the book of Judges and Ruth. It includes a song naming all of the judges. The main idea presented has to do with the apostasy cycle (yes, they use the word apostasy). This is one of the things I really, really like about What's in the Bible. They do use big words, explaining them in ways that are understandable even to my youngest kids. They aren't dumbing things down in their explanations. There is also a great popsicle stick puppet section on Ruth. So, while I'd rather not bring this up, there is something I do have to mention about this volume because I am disappointed. The opening scene for each episode is with a little kid puppet named Michael, who is sitting in the backseat of the van. Off-stage is his younger brother (Michael talks to the brother) and his mother. Mom is putting in the DVDs for the two boys to watch while they are on their way to Grandma's house, if I remember right. Michael has been one of my absolute favorite characters, even though I don't like the tone he uses with his mother. Until this volume. This episode, he has a huge conversation with his baby brother about SpongeBob underwear. Why is this necessary? Not only that, but in the second episode, Cap'n Pete (who is up in an air balloon) has to use the bathroom. So everybody keeps talking about how he is singing extra short songs because he needs to go to the bathroom. Why? Can't we get through a children's show without this level of humor? Only my four year old found any humor in this at all. I don't recall potty jokes in the previous volumes, and I hope this is going to be something they do not continue. One big reason I wanted to mention this, though, is if Volume 4 is your first introduction to What's in the Bible, you need to know that the bathroom humor is not typical. The positives definitely outweigh this negative though. The clip below shows part of how the book of Joshua was introduced. Let's ask the real experts for their opinions though. In their own words, well, minus any lisping. And I'm trying to punctuate the way they talk. Richard (6) - I liked the first episode when they talked about the Israelites and how they had to fight, fight, fight through the second section of Joshua. My favorite character is Chester and his popsicle stick puppetry. He makes me laugh, and I like that we never get to actually see him. I can't wait to see the rest of the series. Thomas (9) - I really like What's in the Bible because it is entertaining but it isn't using stuff like fairy tales -- it is using the real Bible. My favorite characters are Clive and Ian because they are the funniest. I didn't know much about all of the judges until I watched this episode. There's even a song that gives all the names of the Judges, but I haven't learned it yet because they have pretty weird names. Except Deborah and Samson. William (11) - What's in the Bible is a great series for kids because it is teaching about the Bible in a way that is funny and entertaining. I like how they are teaching me how the books are split up. The first three DVDs talked about the Pentateuch, and now we are starting the historical books. I think this is good for people of all ages. And finally. The good stuff. Do you want to win a copy of Battle for the Promised Land for yourself? I have a certificate to give away, and I can't wait to see who the lucky winner will be. Mandatory entry: Watch the video (above, or there are more at YouTube) or visit the What's in the Bible website, and tell me something you learned that intrigues you. Why do you want to win this? Follow me via Google Friend Connect. Two entries if you already were a follower. Follow me via Networked Blogs. Two entries if you already were a follower. Like What's in the Bible on Facebook. Post about this giveaway on your blog, Facebook, Twitter, etc. One entry each. Leave a link where appropriate. Comment on another post on my blog, and come back here to tell me which one. I don't see anything on the certificate that limits where this is good... I'll mail it wherever, but I can't guarantee that the certificate will be accepted outside the US. I'm pretty sure it will work in Canada. I'm not responsible for finding you a Christian Book store where this works. And... this giveaway will close on October 31 at midnight Mountain Time. I'll draw a winner and make a reasonable effort to notify them on Monday. If I cannot contact the winner, or do not hear back from the winner, I reserve the right to choose another. Disclaimer: I received this DVD and coupon for free from Tyndale House Publishers, in exchange for my review. No other compensation was received. The fact that I received a complimentary product does not guarantee a favorable review. I pulled together Scout stuff more than ten minutes before the meeting. Of course, getting two new Tigers in the den last night would have messed up (in a GREAT way) the best-laid plans. But still. It isn't like I don't know it is coming. How tough would it be to find construction papers, stickers and markers, oh, the day before the meeting? I pulled together the materials for the Physical Science class I'm teaching online, oh, say, the day before class. Instead of getting up at Oh Dark Thirty to get up to speed, only to realize there is no lecture quiz. Argh. There is now a quiz. It's the lecture that is lacking. My kids could EVER find their school materials when we are trying to use them. EVER. Okay, I think eveything is present and accounted for at the moment, but yesterday was a joke. I actually found the time to READ the book I committed to review today for Booksneeze. In my defense, this isn't a book I can just sit down and read in an afternoon. I haven't been able to read more than about 3 pages in a sitting, as there is just so much to ponder. So sometime later today, watch for a review. Encourage me. Tell me that it isn't awful. I feel like a total failure on this one. I could be in at least two different places at the same time. I'm having nightmares about Thursday. William and Connor are supposed to be at a Scout thing in the northwest part of town from 4:00 to sometime (5:00? 5:30? I don't know). William and Thomas are supposed to be at Barnes and Noble kind of in the middle of town from 5:00-6:00. All five kids are supposed to be at swim lessons more or less in the northeast part of town from 6:30-7:00. I have no idea how to make this work. I recently had the chance to review Energy: Its Forms, Changes & Functions by Tom Derosa and Carolyn Reeves. This study is meant for 3rd-6th graders, and I've been using it with my 4th grader, Thomas. Richard (1st grade) has listened to some of it too. The book consists of 20 "investigations" about energy, from basic concepts like what it is, where it goes, and how it is stored, to sections on various types of energy such as light, heat, magnetic, electrical, solar, wind, water and nuclear. And it really is at a great level for 3rd-6th graders (or particularly science-loving younger kids too). Each Investigation is set up similarly. There is an introductory section where the student is presented with some questions to think about. Some of these pages introduce (very briefly) a scientist such as Oersted or Faraday. A problem is introduced to be investigated, and the procedure and observations are outlined. The observation questions were great -- getting the kids (and Mom!) to think about what we actually saw as we did the investigation. AFTER that, there is a page explaining the science of what we just did. You know, the stuff most science programs have you learn before you actually do anything yourself. This material was fantastic. Finally, each investigation has a Dig Deeper section, and some questions to review what you learned. The idea is that the students should usually choose one of the Dig Deeper suggestions to follow, depending on their interests. Older students could be expected to do more. Some of these suggestions involve more hands-on, many involve some type of research. 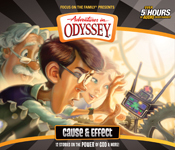 These Dig Deeper options make it pretty easy to beef up this to make it a good study for junior high kids. One problem: it would be nice to have a page in either the intro or the appendix as to what supplies we are going to need to do the hands-on activities. Some of the items we needed are really straightforward and easy to locate, but there are a few that are a bit more obscure (like pipe insulation). It isn't a huge deal, I can look ahead to see what we'll need. But having it all on one page would be more convenient. I don't know if that is something that is included in the Teacher Guide, which is available separately. I do know the $4.99 Teacher Guide does include answers to the questions in the "What Did You Learn" section, which would be handy -- particularly if you are having your student do this independently. The Teacher Guide also includes some additional activities. We've been loving this study, and I am thinking about looking into some of their other books too. Forces & Motion or Matter. Not sure which ought to be first. I have used a couple of the books in the Life Change series before in a small group setting, and I thought it would be really great to use Psalms for personal study as I am unable to attend my local small group this year due to scheduling issues. Unfortunately, my overall response to this particular study is that I really, really need the discussion from other people to make this study of Psalms work. Not that this isn't a good study. Over the course of ten lessons, you study a few Psalms in depth and you have almost all of the Psalms assigned in one of the lessons. Each lesson is set up with a key verse, a lesson objective, a desired action, a list of psalms (as few as 5 to as many as 40) that fit the lesson's topic, an introductory paragraph, and then the 'meat' of the study. That study is split up into four to five sections, each focusing on a section of a psalm. Half of the lessons study only one or two psalms. Half of the lessons have you studying a portion of a different Psalm each day. The study really is great for a small group. One aspect I particularly liked with John in our small group that is also present in Psalms is the extra information segments that occur at the end of each segment. Each is a short description of something from the reading -- a cultural practice that wouldn't be familiar to modern readers, an elaboration on on concept, or something. I love these. Another point in small group study is that there are plenty of questions at different levels -- you won't discuss them all, and some would be totally inappropriate in some groups. But there are plenty of questions to choose from. If you are looking for a personal study, my recommendation would be to get a good look at the specific book in this series that you are thinking about, and to figure out if it will work for you. John, which I did in a small group, would have worked for me on my own. Psalms does not. For this particular book, for me, I need the input of others. a. Why you joined the MHLRC. My friend Karla blogged about it, and it intrigued me. I've never read any Lovelace books, and I was wanting to find something to read to my only daughter. So I joined. b. Which book you are currently reading for the challenge. I found Betsy-Tacy on my shelf, so we've started that. I also put Betsy-Tacy and Tib on hold at the library. I'll be picking it up on Wednesday. I have the feeling I'll be reserving more. c. Something new you have learned either from participating in this challenge or from a MHL book you have read. I had NO IDEA that Maud Hart Lovelace was a Minnesota writer. Now I want to read everything she wrote. d. Which book in the Deep Valley series you hope to win and why. I think I'd want to win the Winona's Pony Cart/Carney's House Party volume. Mostly because the pony cart story sounds a little closer to my daughter's age level, and I love the idea of discovering these stories with my daughter. Suzanne Woods Fisher is thrilled to announce the release of The Waiting , book two in The Lancaster Secrets Collection. In The Waiting Jorie King has been waiting for Benjamin Zook to return home to Lancaster County so they can marry. When news arrives that Ben has been killed, Jorie finds comfort in the friendship of his brother Caleb. That friendship ripens into love and it seems that they are meant to be together. But when the unexpected happens, their worlds are turned upside down once more. Will Jorie trust God to lead her into the arms of a new man? A must read! Visit the blog tour and find out what the reviewers are saying! 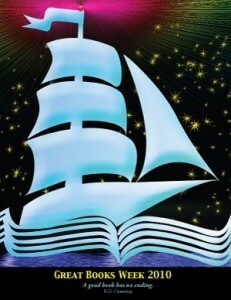 Learn more about Suzanne and her books at www.suzannewoodsfisher.com! The Waiting is the next stand alone story in The Lancaster Secrets Collection and follows in the footsteps of the best-selling, The Choice . 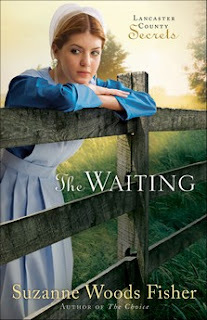 The Waiting is in stores now and to celebrate Suzanne is hosting The Waiting KINDLE Giveaway. 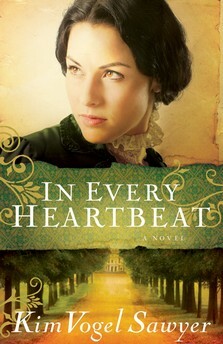 Join Suzanne for the Lancaster Secrets Book Club Party on October 28th! She'll be announcing the winner of the The Waiting KINDLE Giveaway, hosting a book club discussion of The Waiting and The Choice, and giving away copies of both books and HEAPs of readerly prizes! Be sure to join us on Thursday, October 28th at 5:00 PM PST (6:00 MST, 7:00 CST & 8 EST) at Suzanne's Author Page. My take: I picked this book up to read a chapter or two, and I literally did not put it down until I had finished it. I was completely drawn in to the lives of the characters and into the storyline. The story takes place in 1965, and I'm not sure I've read much set in that time period, except some civil rights protest types of books. This did present some of the big issues of the day, namely racism and the Vietnam War. It also dealt with issues like parents being able to direct the education of their children. But while those things were important, really, this was just a great story. The characters felt like real people, the places felt real. One of the publisher's statements that really resonates with me after reading the book is "a multifaceted story about complex people living the simple life." I immediately put the first book in the Lancaster Secrets series on hold at my library. What book or books do you read over and over? Anne of Green Gables series. I didn't discover Ann with an E until I was in my 30s, but I return to these books again and again. Pretty much anything by C. S. Lewis. The Hobbit. Haven't tackled the Lord of the Rings books yet, but I have read The Hobbit a few times. Goodnight Moon. Because, well, that book has been well-loved by at least one of my children for pretty much all of the past dozen years. You know what, though? I still do enjoy reading it. Click the Great Books graphic to read other responses to this question. What Childhood Book Captured Your Imagination? This is a challenging question for me. While I read extensively as a child, I tended to read a lot of, well, twaddle. I was never exposed to great books, or at least was only rarely exposed to them. So... I'm trying to come up with an answer to this. And I think I'm going to have to list a couple of things. I read and re-read, and re-re-read the entire Little House on the Prairie series. I wore Little House style dresses and bonnets to celebrate the bicentennial. We visited DeSmet, SD and all the Laura Ingalls Wilder locations there. I loved the biography section of my elementary school library. Pretty much everything there was either from Revolutionary War times, or from Civil War times. I remember my mom fighting with the school librarian to allow me to check the books out, and I'm so glad she did that. I hated history in school, but I adored biographies. I remember reading a book about Deborah Sampson and wondering why we couldn't learn stuff like this in history class. Hmmm. You think this impacted how I choose to homeschool my kids? I never thought about that before. Wrinkle in Time. I remember being totally enamored with this book. And I loved reading it with my kids just a year or so ago. When I hear the name Digital Frog, I immediately think of the virtual frog dissection software that I've heard so many wonderful things about. However, I knew that they had other products as well, because Connor just finished using their Science Matrix software alongside his biology class (which relates to cells) and I had heard about their Virtual Field Trips as well. I was thrilled to learn I'd be getting a DVD ROM of all three field trips to review for the TOS Homeschool Crew. The software did not disappoint -- it is high quality, and since I knew it was intended for middle school/high school, I was really surprised at how well it works for much younger ages as well. 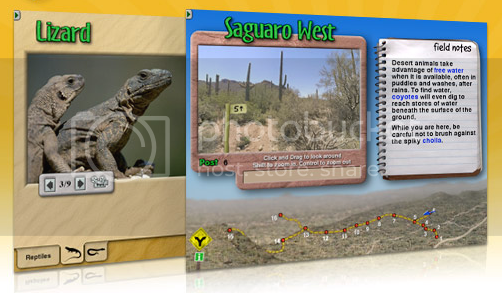 The Virtual Field Trips contains three programs: The Desert, The Wetlands, and The Rainforest. Unfortunately, we just did not have time to work with all three in time to complete this review, so I will focus on The Desert. The teacher materials included on the disk suggest a couple of ways you can use the program. They also include suggestions for grades K-3, and grades 4-12. One way they suggest using the program is "as recreational study." That is what we chose to do at the moment. Upon inserting the disk, and choosing to use the Desert, the kids had the option to do a Quick Tour. This leads the student(s) through the features of the program, and my kids found this to be an excellent introduction and overview to what they could do. Field Trip: This lets you go "visit" five deserts of the U.S. Southwest. Each of these field trips allows you to scroll 360 degrees, and jump from one "stop" to another. Each stop includes information about what you are seeing, and sometimes you can go deeper for more information. Sometimes you can access quizzes from here as well. Desert Types: plenty of text about different ways of classifying deserts and about aridity. Then there is a world map that shows deserts, and you can click on various regions to read more, and to view photos. Desert Study: this section includes a ton of information on things like homeostasis, adaptations of plants and animals, specific information about a number of organisms common to deserts, and a Build-a-Desert game. My 9 and 11 year old spent a lot of time in the game. Mechanisms of the Desert: includes sections on climate, landscape formation, and water. Within these are many, many subtopics. Human Impact: this section talks about all sorts of ways people are impacting the desert. This isn't a section my kids opted to do much with. Many of these sections include photographs or videos, all have fantastic detail in text. You can click on pretty much any word in the program to have it defined for you. And there is also a workbook and teacher guide included, so I can have the kids work through this in a systematic manner. Some of the worksheet pages are geared to the younger kids, but most are upper levels. Digital Frog's Field Trips DVD ROM is available for $125 (or higher, for different license types) and this works on either a PC or Mac (we tried it on both). Fabulous resource, and one I am very glad to own. Disclaimer: As part of the TOS Homeschool Review Crew, I did receive a free DVD-ROM from Digital Frog International. The fact that I received complimentary products does not guarantee a favorable review. It does guarantee a review. A fair review. But I am not going to praise something unless I think it deserves the praise. If I don't like it, you'll hear that. And hopefully with enough detail as to why so you can decide for yourself if what I hate about it makes it perfect for your family. For more about my take on reviews, visit my blog post here.